Astrikan (also known as Kalmykskaya, Kalmyk, or Kustenair) horses are members of the Mongolian equine group.They are bred in the territory along the Volga and Ural rivers and are in danger of becoming extinct. They were brought by the Kalmyk people came to Russia from Dzungaria in the 17th century. They were described as plain, medium-sized horses that are very tough and possess speedy gaits. They look similar to Kirgiz horses, but tend to be coarser with longer legs. Selective breeding of these animals ended around 1943 and many crosses have modified the bloodlines considerably. In 1986 the local University of Cattle Breeding attempted to determine their numbers and located an isolated heard in the eastern regions that seemed to be of purer blood. Of around 2000 horses, only about 500 were considered suitable to develop a breeding farm in an attempt to preserve the breed. Astrikan horses generally stand 15 to 15.1 hands tall. Their coat can be bay, brown, black, chestnut, gray or roan. 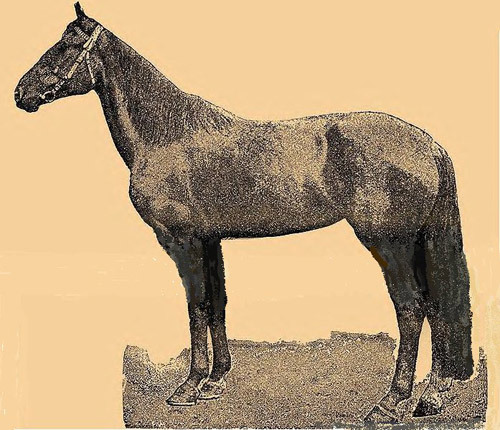 They have a light head with a straight profile, a muscular neck, and prominent withers. Differences in management styles have produced two sub types with the breed. The first type, kept stabled, given better food, and bred very selectively, were saddle-type horses. The second type kept in the steppes, herd-bred, and left to forage for much of their food, were a hardier type more suited for light draft work. These horses are slow to mature, taking 6 years to reach full development and are calm and docile by nature.